One of my favorite National Park stops on the Gypsy Trip, Yosemite National Park was another place where we checked out the high points and were left wanting more. When I was going back through the video for this part of the trip, I didn’t come across many clips. I also couldn’t remember much about visiting the park. 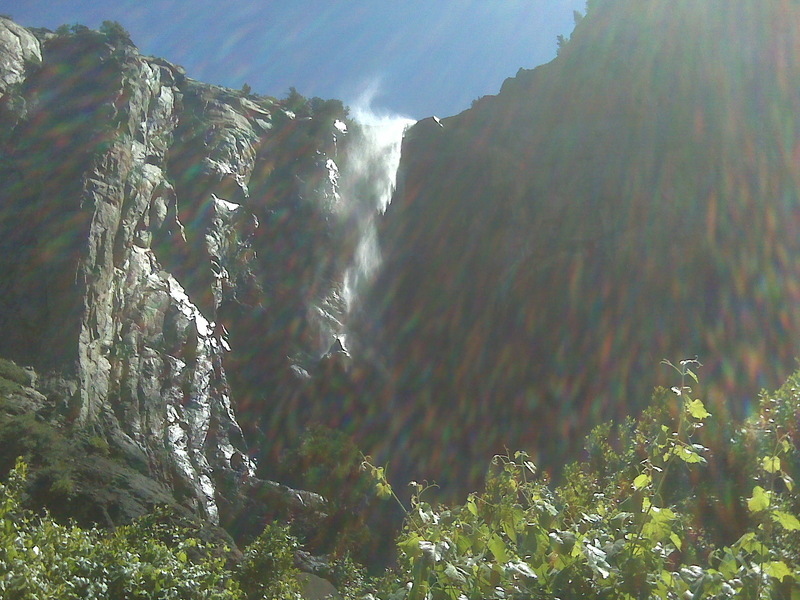 I remember Bridal Veil Falls and that was about it. So I looked up the first telling of this story. By this point of the trip we’d gone as far west as we were going to and had started the return trip home. With only a few days left on the trip, we were tired and tired of eating out of the trunk of the car. We were tired of sleeping in tents. And we were disappointed that we weren’t able to finish going up the West Coast to Washington. After the excitement the night we arrived in San Francisco — the night we thought we had enough time to drive to Seattle — we just crashed. In the time it took to try to map out a route from northern California to Seattle, we realized there just wasn’t enough time. We went from being at the top of El Capitan to the bottom of Death Valley. The Gypsy Trip had switched from embarking on an exciting adventure to finishing out a list of places to see on our way home. That was how we treated Yosemite: Not as a place to explore and experience, but as a place to come in, check out the high points, and high-tail it out to the next destination. in retrospect, I wish we’d taken the extra time to go up the coast. It would have been impossible to do it on the timeline we agreed to, and I would never have been able to get back to work on time. I was worried about getting in trouble for attendance, but I shouldn’t have been. I came back to work for about two weeks before leaving permanently for an internship. What’s the worst they could have done? Fire me for my last two weeks? So here’s the lesson to take away from my trip to Yosemite: Take the extra days NOW. You never know where life will take you, so enjoy the sunshine while it lasts. Featured image credit: From Flickr Creative Commons, By Edward Stojakovic. After the massive amount of blogging I had to do the last couple of days to get caught up from when my wireless network abandoned me and my Blackberry decided to revolt, I took about 24 hours off. I’m terribly sorry, because everything we saw yesterday in Yosemite and San Franciso should have been immediately shared. I’ve wanted to visit Yosemite National Park since I discovered Ansel Adams’s photograhy when I was a teenager. I had his photos as my desktop backgrounds for years. I finally got to visit and I was not disappointed. Of course, we had limited time and didn’t get to explore the park as much as we all wanted to, but we did get to see some breathtaking rock formations and Bridalveil Falls. 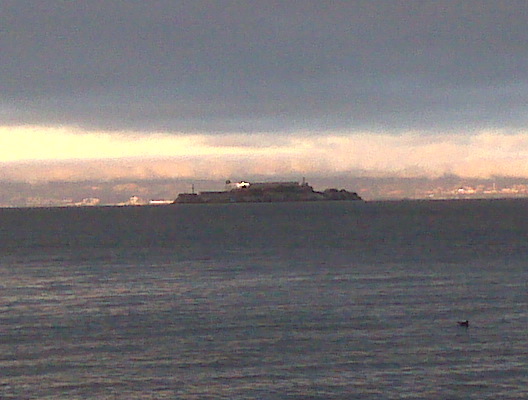 San Francisco actually turned out to be the best part of my day. Not that I was expecting to dislike the city; I knew I would enjoy it. I’m just usually more of a park kind of girl and less of a city kind of girl when it comes to visiting new places. We ended up getting to see a good portion of the city because Google Maps, not Sheila this time, led us astray. 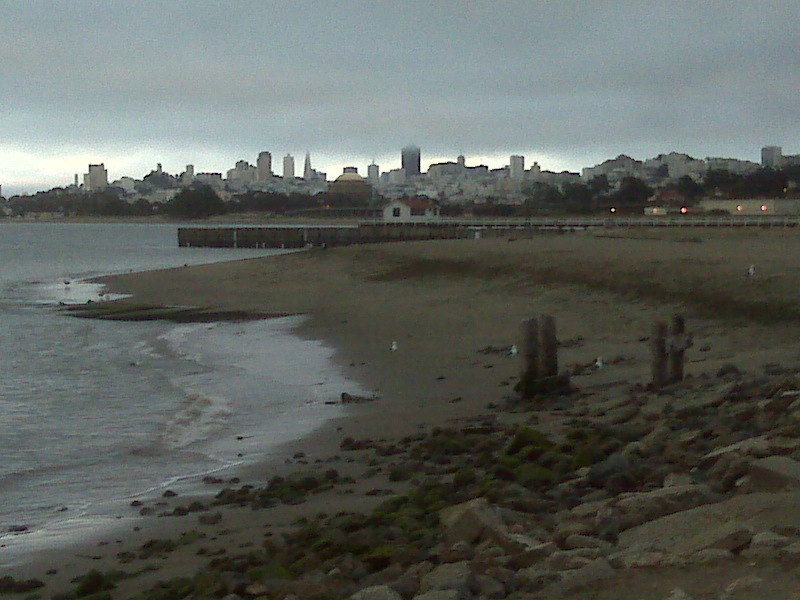 When we got into the city we drove along The Embarcadero and got to see most of the piers. The real fun began when we tried to find Lombard Street so we could drive down the twistiest road in the city. Google maps kept having us turn off The Embarcadero and circle a few blocks and then go up The Embarcadero further and circle a few other blocks. I think we circled a four or five times before we finally tried plugging a cross street into Sheila and seeing if she could get us there. We finally gave up, but even though we didn’t find Lombard Street, we got a nice driving tour of some of the streets of San Francisco. 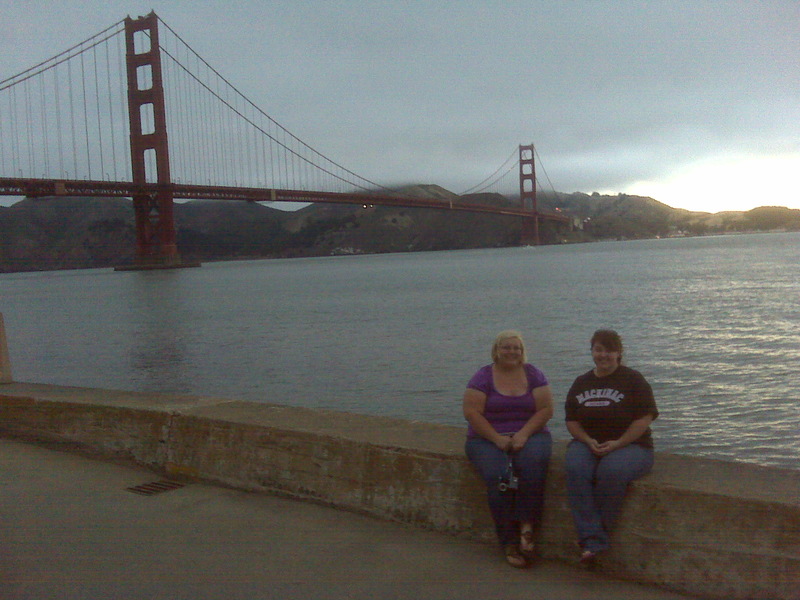 In our search for the twisty road, we found a park on the bay under the Golden Gate Bridge and were able to get pictures of the bay, the city skyline, Alcatraz, and of course, the Golden Gate Bridge. I could have sat on this wall forever, taking in the bay, but it was chilly outside and getting colder. Don’t forget a hoodie if you plan to go to San Francisco! By this time it was going on 9 o’clock and we were all famished. We haven’t gotten much better about making time for meals in our travels; we’re usually just in a hurry to get to the next place! 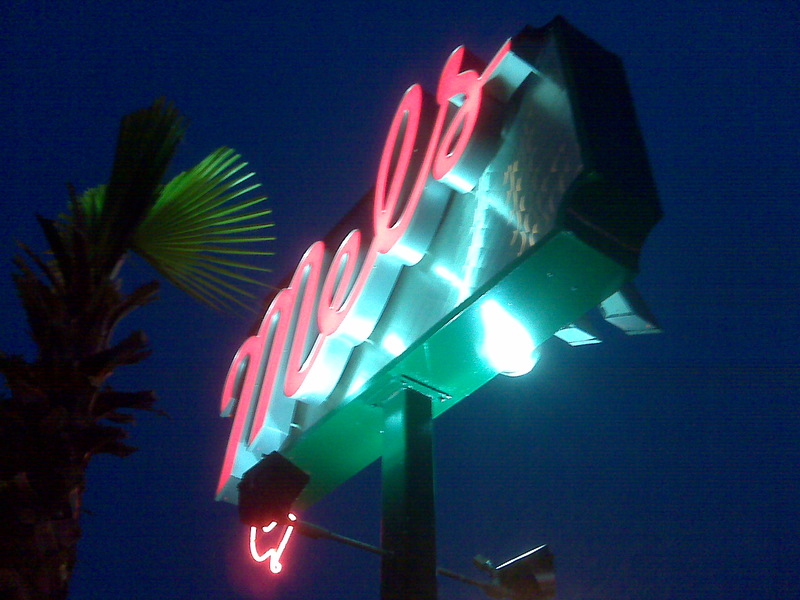 We decided to stop somewhere on our way out of the city to eat something other than a hot dog or a turkey wrap. 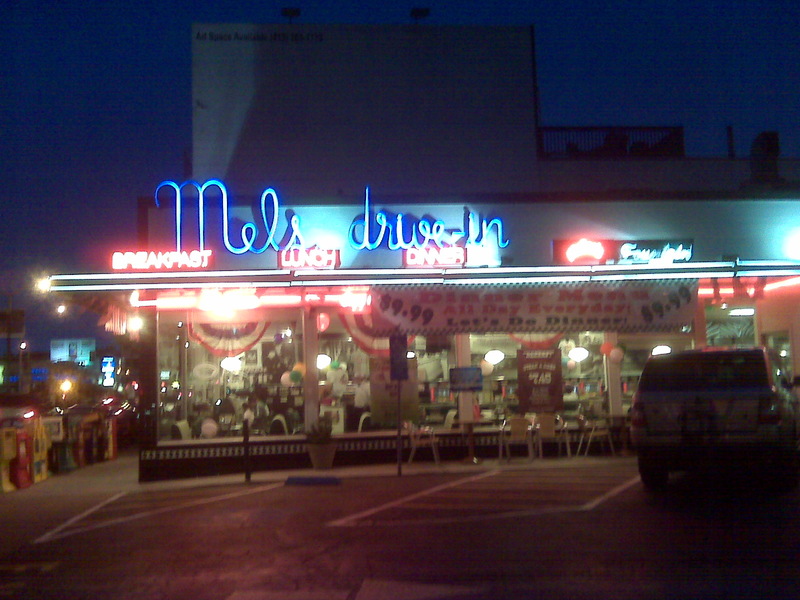 We found Mel’s Drive-In on Lombard Street and decided to stop. It’s kind of hard to miss this charming little silver diner with its neon signs. I ordered a charbroiled chicken sandwich with twisty fries, and I suggest you do the same. It could have just been that I’ve been deprived of decent meals for most of this trip, but that was the one of the best chicken sandwiches I’ve ever eaten.